3rd Power's popular Dual Citizen head with added spring reverb! Or, apply & pay as little as $70/mo. The good folks at 3rd Power have done it again with their Dual Citizen model! This baby is like having the best of both the American and British worlds of amplification at your beck and call. Have a hankering for sweet tweed and blackface tones? Check! Want four different vintage AC preamp voices at the turn of a knob? Here you go! (With the addition of the mid-boost/cut switch, it's actually like having 8 different voices on the "Vox" side alone!) The dual mode reverb is like having the best reverb pedal you've ever played through built right into your amp and for those of you that like to run your Fender and Vox amps in stereo (you know who you are...), the Dual Citizen allows you to run both channels together for that very sound. This amp is a tone giant with one foot on either side of the Atlantic! 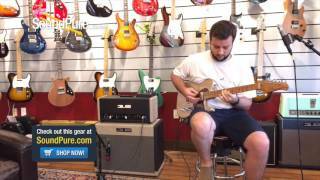 In this video, Sound Pure electric guitar expert Matt Anthony runs us through several pieces of equipment including a 3rd Power Dual Citizen head w/ reverb, a 3rd Power Dream Series 2x12 cab, a Suhr Classic T Shoreline Gold HH electric guitar and a Strymon Timeline multidimensional delay & looper pedal. The Dual Citizen is Jamie's take on vintage British AC tones combined with vintage American clean tones. It possesses the soul and fire of these legendary vintage amplifiers and includes a freshly designed Class A dual triode vacuum tube effects loop designed to get the most out of vintage and modern effects pedals. You'll be amazed by DUAL CITIZEN's crisp performance with outstanding precision, beauty and rugged construction. Inspired by classic vintage amplifiers, the Dual Citizen features a comprehensive AC experience on channel one and classic Blackface and Tweed tones on channel two. The input section features two jacks that allow you to either run both channels combined, or run each channel individually. Channel switching mode is possible with the included hand-wired AB box. Four different vintage AC preamp voices plus a mid boost/cut switch are provided, including Normal, Brilliance, Top Boost 1 and Top Boost 2—even a Top Cut control is on hand to fine-tune your tone. Two different vintage American preamp voices are available via toggle switch, including Tweed (based on a '59 tweed bass amp) and Blackface (based on a '63 blackface bass amp). When you select your sound, you are switching entire preamp and tone stack circuits that faithfully recreate a superb vintage vibe. Blackface mode delivers that classic "scooped mid" American sound with excellent headroom. Tweed mode has that meaty "mid growl" and sweet top end that just oozes with vintage "voodoo." Q: Does it take pedals? Here's what you need to know about the DUAL CITIZEN's new tube buffered series effects loop: you don't have to change the way you already configure your setup. Run your pedals up front or in the loop - it's all good! However, should you wish to experience STUDIO QUALITY TONE from your pedals, then go ahead and run them through the loop. Seriously - try your delays, reverbs, phase, chorus, even your drive and compressor units through our new loop. You will likely attain a superior level of resolution and clarity that our many beta testers referred to as "more 3D." Additionally, the DUAL CITIZEN's effect loop is somewhat of a Swiss Army Knife for your rig and here's how it works: After each channel preamplifies your guitar signal, they are combined and sent out of the FX SEND jack at a nominal -10dBV (just under 1V p-p) matching the levels most vintage and modern effect pedals want to see. The FX RETURN path brings your signal back into the amplifier with a tremendous amount of headroom (accepting signals as low as -10dBV and as high as +4dBU before the onset of compression). It can also be a gig-saver too. If your pedal board ever goes down during a performance, you can plug your guitar straight into the FX RETURN jack and get through a song with quality tone. For the ultimate experience in the "feel" department, we built in two rectifier tube sockets that are controlled via toggle switch. Choose between various tube rectifiers or even a solid-state rectifier adapter and easily toggle between whichever you prefer. HybridMASTER™ and the Venue Switch are located on the front panel giving you the confidence to play what you feel when you feel it at exactly the volume you need for the occasion. Think of the Venue Switch as a "macro" volume adjustment - choose between full volume (Stage Mode) or an 80% volume reduction (Studio Mode) - and the HybridMASTER knob as a "micro" volume adjustment allowing you to fine tune your output levels. Our patented HybridMASTER is volume management executed to perfection. Dimensions: 24" x 10.5" x 9.33"